Steve Gruenert is a professor at Indiana State University. He has studied organizational culture and climate for more than 20 years and continues to learn and collaborate with other researchers as these concepts evolve. Steve is the coauthor of School Culture Rewired: How to Define, Assess, and Transform It and Minds Unleashed: How Principals Can Lead the Right-Brained Way. Why do some schools succeed while others struggle? Why do policies and programs often fail to deliver what they promise? 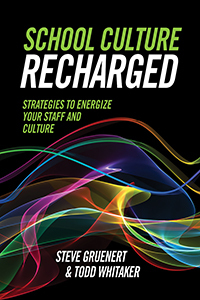 In this follow-up to their insightful School Culture Rewired: How to Define, Assess, and Transform It, authors Steve Gruenert and Todd Whitaker offer practical advice and strategies that help you build positive energy to reinvigorate your school's culture and staff. For education leaders at all levels, this book delivers a compelling message: Understanding and harnessing the transformative power of school culture can propel your school into the kind of place where teachers want to work, administrators can focus on what matters most, and students can thrive.